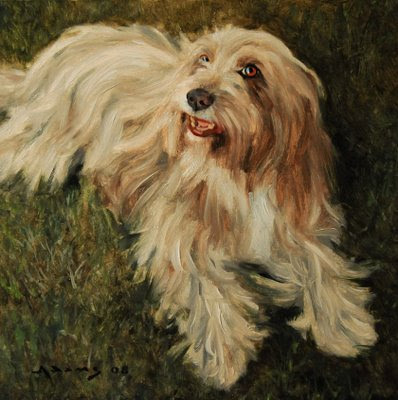 This sweet Bearded Collie belongs to my friend Diane. Mimi was a rescue dog who now lives with her two brothers, both Standard Poodles. There is no question who is the leader of the pack and that's Mme. Mimi. I caught her just before she struck a less ladylike pose that begged for a tummy rub. il pranzo da me stessa. ma prego assai il Signore. Ma i fior ch'io faccio, ahimè! non hanno odore. Altro di me non le saprei narrare. che la vien fuori d'ora a importunare. but my real name's Lucia. is making lilies and roses. and I eat all alone. but I like to pray. I look at the roofs and the sky. the sun's first rays are mine. April's first kiss is mine, is mine! The sun's first rays are mine! I breathe its perfume, petal by petal. So sweet is the flower's perfume. OK, so I lied. Perhaps it doesn't have to be an animate subject to have fun with the light and paint. While I was in "chrome" mode I thought I would experiment with some loose paint and a piece of iconic porcelain. No Dadaist I, but I figured if it was good enough for Marcel Duchamp last century with his readymade "Fountain," why not have a go (no pun intended) and reprise it here. 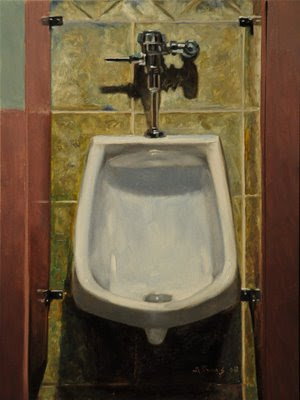 This particular plumbing fixture resides in the mens room of the Dogwood Gourmet in Baltimore. Elegant marble tile, rose tones and dramatic lighting raise the lowly pissoir to new heights, creating a theatrical aquatic display. I'll be out of the studio for a couple of days. Look for new work on Saturday. So much for taking it easy after my operation. The painting you see here may prove to be what is known in artistic parlance, as a "unique" - a unicorn, dodo bird, an Ivory-billed woodpecker, the last of its kind. 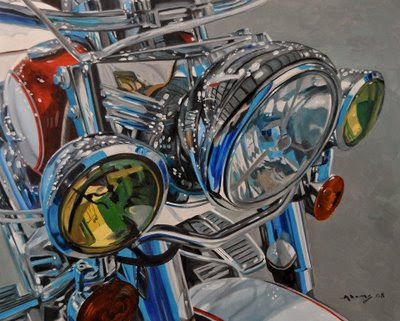 I don't know what possessed me to undertake such a painting other than my love of motorcycles and needing to ramp up the wow factor after my being away from the easel. Do I like this painting? Most definitely. Would I do another one? I'm not sure. Although I am delighted with the finished product, the application of paint was tedious; observe, mix, dab, repeat. No subtle glazes and bravado brushwork, merely precise placement of just the right color. Wearing an opti-visor and using 1/8th inch filberts and a lining brush is really not my thing. 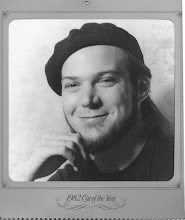 I am and have always been about the creative process, not necessarily the final product. If the process is good the resulting product will follow suit. Perhaps that is why I like painting people and animals. There is room for the brush to interpret. Maybe painting inanimate objects isn't in me. I have always been a figure and portrait painter. I like my work looking back at me as I go along. OK, maybe oysters don't exactly gaze out of the canvas, but you get my drift. So enjoy the Harley. Which is all I can do with my own Harley - look at it, as I am not allowed to lift it off the side stand for another 4 weeks. I couldn't have had my appendix out in the dead of winter. Nurse Susan says I have over done it today and so I must wait until tomorrow to finish the Harley painting. She is probably right, as usual. Oh well. Check back, it is a very strong piece. 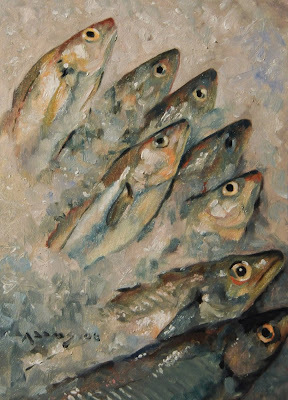 Here is another painting for the upcoming "Fish and Fowl" show at the Ice House Gallery in Berkeley Springs, WV. 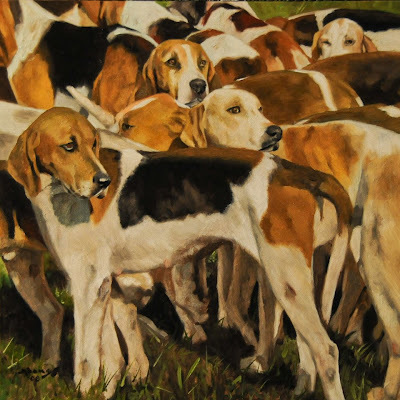 I am putting it on the Daily Painters site as "contact me for availability" since it is possible that they may swim back upstream to the studio after the show. 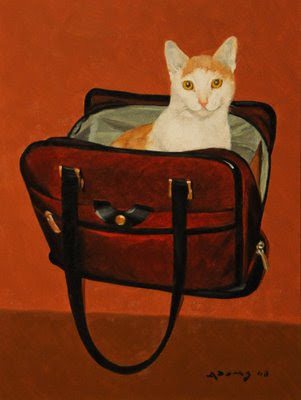 "The Cat's in the Bag"
I still had the notes on my palette set to paint JJ so I thought I'd add a touch of whimsey and go a bit graphic with this one. There is a painter in New Orleans named George Rodrique who has made a handsome living painting his dog Tiffany, aka the Blue Dog. His "Blue Dog" series is good fun and while I am not attempting to emulate him here, there is an amusing similarity. I like the fact that it is a total opposite of his (i.e. orange instead of blue, cat instead of dog). I should paint something completely different tomorrow, JJ is getting a big head from all this attention. This is my cat JJ's favorite place to sleep. In the afternoon the western sun shines through the office window and warms the great mahogany desk and the small laptop, already warm from its own power, becomes a relaxing pillow. Needless to say, my wife has to coax him off with treats to resume work. More often she will use the downstairs desktop, rather than disturb him. 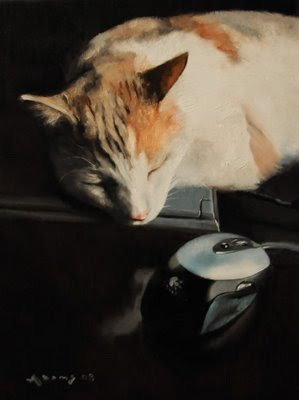 She used to leave the laptop open, but that resulted in him sending odd e-mails in secret, cat code that only his feline friends could decipher. Leaving the laptop half-closed was no good either. It took him no time to figure out how to close it all the way, resulting in turning off the computer; oops, where was I? He is a great cat and a fantastic mouser to boot. He has found quite a few in his forays into the basement. I couldn't resist the visual pun here. I have paid my dues to the appendix gods and have laid about for a week being a slug. I am happy to report that I am on the mend and able to stand for a few hours at a time. That said, I decided to start off small. 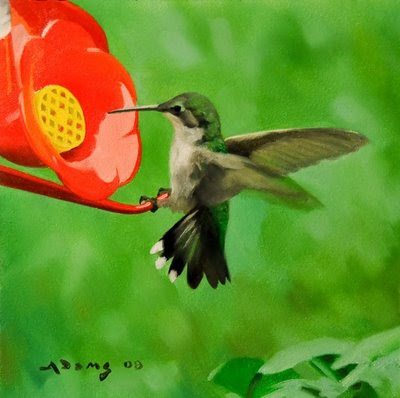 It doesn't get much smaller than a hummingbird, so here she is, as seen from my kitchen window. I am endlessly amazed at the aerial acrobatics of these tiny creatures. They are quite territorial and protect their turf with the intensity of a World War I Sopwith Camel dogfight. Standing in for Mark for this post is his wife. You know, the one who so often looks at one of his finished paintings and says, "I love it all, but for that little splash of white there," to which Mark replies, "That's exactly what makes it sing to me!" And I usually come around to appreciating the splash of white in time, though occasionally the splash of white will be softened to appease me. Mark is currently in the hospital, having had his appendix removed Friday afternoon. Pesky little things, appendix. What purpose do they serve, anyway? If you can do just as well without them, then why the heck do we have them in the first place? Be that as it may, my poor boy's appendix was quite angry - I believe the semi-technical term is "hot." And so the hospital is where he will remain until Monday. I don't know how much time he will have to recover before being able to stand in front of an easel for hours on end. I would suggest you will likely see a few small, simple pieces in another week or so. It may be a while before he can tackle anything as complex as the hounds. And so this site is temporarily on hold due to technical difficulties. Please keep Mark in your thoughts and I know he'd love to hear from you via comments to this post. Here is the finished painting. I am happy to report that freezing one's palette does work to keep the paint from drying out or skinning over, even earth pigments. You learn something new every day. 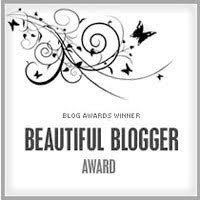 I read this tip (no, not from Heloise) on the comments page of someone's blog. Whoever mentioned this, I am grateful. I used to submerge my palette in a tray of water, which also works but it is not ideal. Call it perverse, but while I painted this piece I was listening to a recording of the original Broadway production of CATS. Anna, who is on my lap as I type this, thinks it was purrfectly fine. She does question my masculinity on occasion; show tunes and all that. 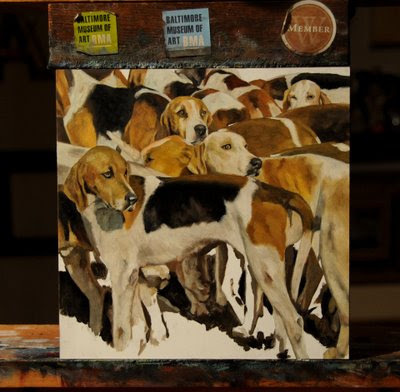 work in progress - "Foxhounds"
In keeping with the dog days of summer, I have started this painting of a group of fox hounds waiting to be blessed on Thanksgiving morning in Glyndon, Maryland. Here is a rare glimpse of my working process. I am going to try and freeze my palette to preserve my mixed pigments. Look for the finished painting here tomorrow. What is it about a patch of sunlight that draws an animal to it like moths to a flame? My cats JJ and Anna live for these hot spots. On any sunny morning, the competition to see who gets to sit in the chair by the east window in the kitchen begins, each cat vying for that precious patch of solar real estate. My studio faces due north, so there is no direct sunlight, much to their dismay. When we were looking to buy our first house years ago, the realtor would remark about the wonderful sunlit room that would make the perfect studio. Perfect for getting a tan, perhaps. The reason north light is great for painting is that it is cool, constant and indirect. That beacon of bright sunlight is not a welcome guest in the studio, reflecting its warmth off the oak floor and onto my canvas. My studio has two huge north facing windows and skylights which are a wonderful source of illumination. However, two oval windows, high on the east and west walls, alert me to brave Helios' presence. The west window I can easily close off by going into the loft and covering it with a makeshift cardboard disk. The East window is more of a challenge. Closing this aperture requires a long telescoping pole and some dexterity to place the disk just right. 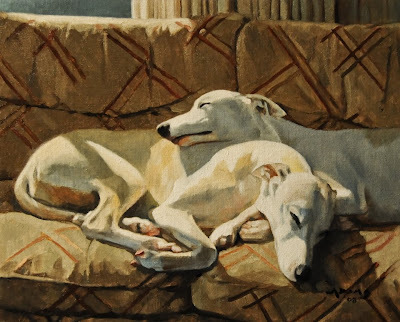 The Wiktionary (sorry Daniel Webster) describes the expression "Let sleeping dogs lie" as thus - To leave things as they are; especially, to avoid restarting an old argument; to leave disagreements in the past. - Eventually, they decided to let sleeping dogs lie and not discuss the matter any further. I have found this to be sound advice in matters domestique.